I can’t believe it’s been two months since I last posted. TWO MONTHS. Well, the reason I’m here is a complete stranger mentioned he was a fan on Twitter. I didn’t think anyone was reading anymore, I figured the blog – after not being updated in FOREVER (well, not literally) had just been forgotten. Did you read that in a melodramatic voice? Because you definitely should’ve. Try it. Anyway, huge shout-out to http://staatic.tumblr.com for inspiring this post. It’s my last weekend in my hometown for a bit as I’ll be shipping off to NY soon and the above kind stranger hinted at the idea of an NY edition of this blog. So without further ado, come this weekend I’ll snap pictures of any street art of street art-related material and I hope you’ll enjoy it. While I’m gone there’s a few art shows still running, and soon opening, that I think you should check out (and that are somehow street art-related). Why: RISK is a legendary street art and graffiti name. 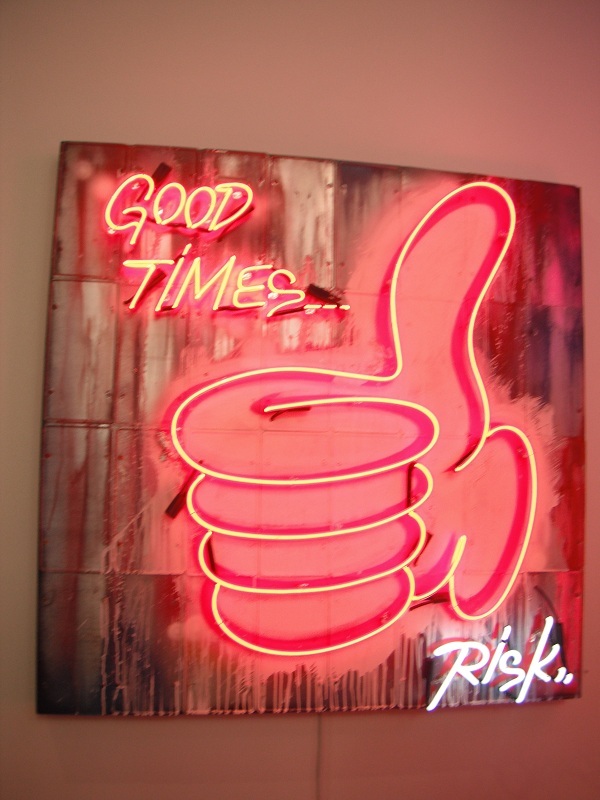 And most of the pieces up at the gallery, as part of his “Old Habits Die Hard” show are done in neon. How much more convincing do you need? There’s also a random surprise upstairs that you can’t miss (literally). A lot of these works were also in a private, invite-only event where the works were inside someone’s home. Can’t get any cooler than that. On the non-street-art end, Colin Christian giant plexiglass female statues will definitely catch your eye and maybe steal your heart. Where: Corey Helford Gallery in Culver City. Plenty of street parking and also restaurants and a movie theater nearby. 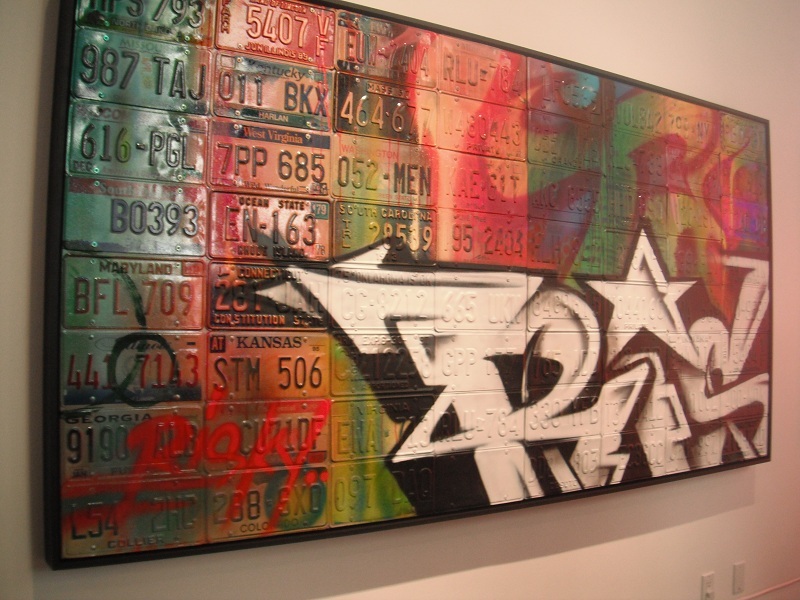 WHY: Saber and Revok are also two very big names in the world of street art and graffiti. It’s a worn subject matter, but it really IS interesting to see the works of these mostly outdoor artists manifest themselves in the gallery’s white walls. I previously covered Zes and Retna’s show in the same locale and it was interesting to see the shift from large murals to pieces that meshed with the walls. Where: Known Gallery on Fairfax not too far from Miracle Mile in Los Angeles. It’s a nice few blocks of culture – there is the SUPREME store right next door. I also stumbled upon Odd Future’s pop-up shop nearby and apparently one of the kids that skateboarded across the street during a green light was a part of the crew. The Hundreds is nearby, too. Keep an eye out for plenty of street art on the sidewalks, walls and light poles. When: Show opens July 28 at 8 p.m. and runs until August 11. Check out more information on the gallery’s site. WHY: I had trouble first researching him and finding out just what KIND of artist he was – sculptor? some talk about being a guerilla artist? 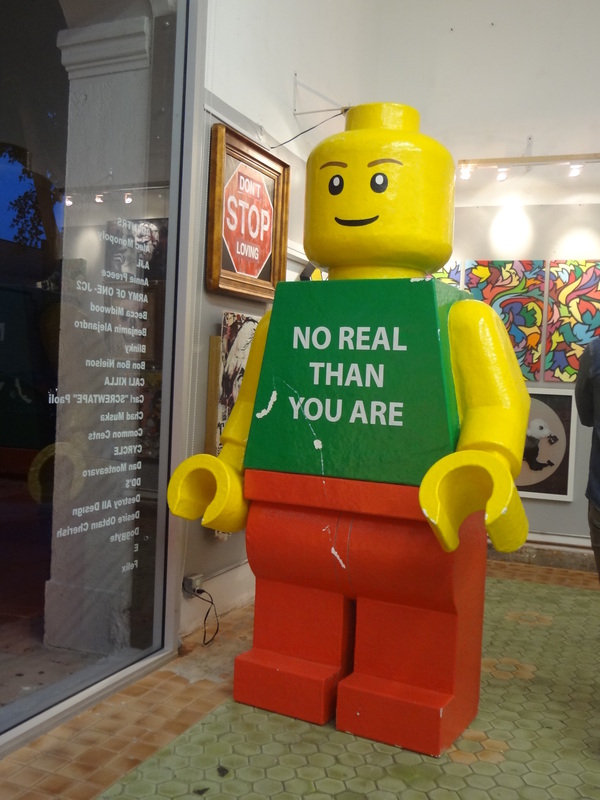 – but the second you drop off a giant LEGO man on an otherwise calm shore of Topanga State beach, you’re a street artist in my book. 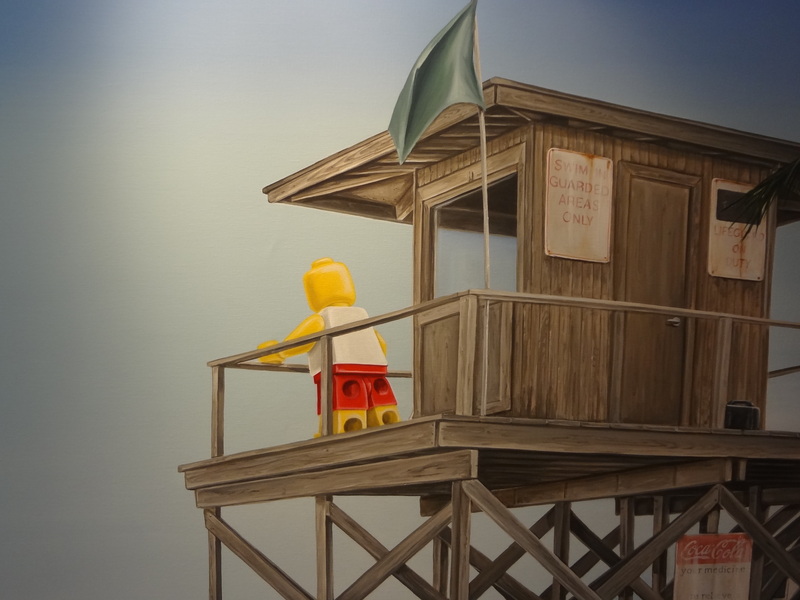 Visit the show to see the giant LEGO man himself and also check out paintings with plenty of LEGO people. 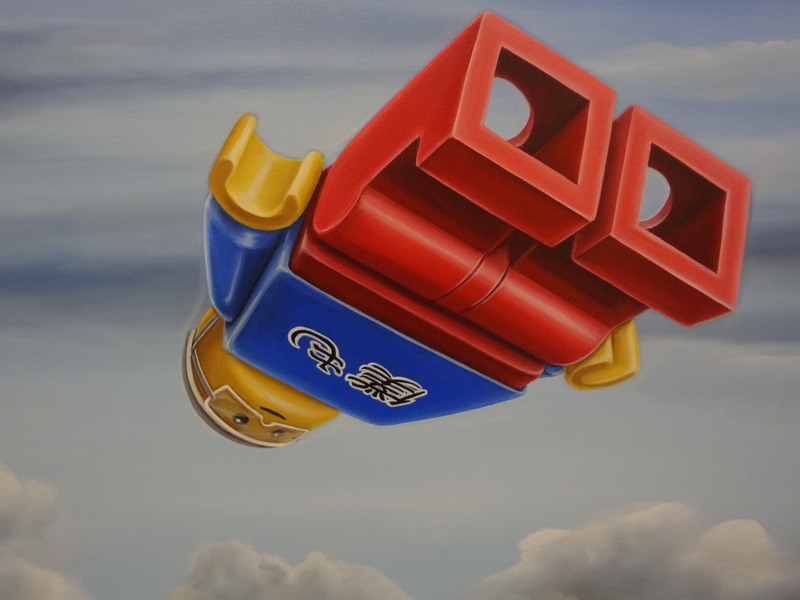 There’s humor in plenty of the pieces but I got philosophical for a bit – are we really just as interchangeable and easily molded as LEGOs? Where: LabArt, the biggest street art gallery in Los Angeles. Also in a great cultural area. If you’re a date take her/him to Cafe Verona next door and the love (/whatever else you are searching for) odds will be in your favor. Good things come in three, right? For my purposes, they do. Hope you like the post and I’ll try my best to snap photos in NY! And hopefully I can look as happy as this guy when I’m sitting scared out of my mind inside the plane. Here’s to more street art adventures! This entry was posted in Uncategorized and tagged art, Cafe Verona, Colin Christian, Ego Leonard, fairfax, graffiti, Known Gallery, Lab Art, los angeles, New York, Retna, Revok, RISK, Saber, street art, ZES. Bookmark the permalink. Yes, I’m definitely still here! I’m still following this blog and I’ve missed you posying so please keep it coming!